Denise and Sienna track Nazis! Denise Gard performs a variety of programs for seniors at Independent Care Facilities, Assisted Living facilities, Skilled Nursing, and Memory Care facilities. She specializes in telling engaging stories that stimulate increased brain function. She performs Historical Tales, Colorado Mining Stories, and Native American Tales just to name a few. Other themes are available upon request and programs can be catered to your needs. Denise always brings her talented dog, Sienna, with her. Sienna performs tricks for the seniors and every senior is able to pet her. Flappers, Floozies, and Gangsters: Tales from the 1920's! and causes quiet a sensation. 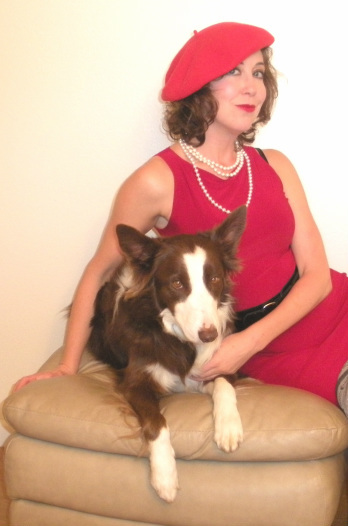 Sienna is a Floozy working for Al Capone; she's a dog who suffers from a bad addiction. She'll do anything for her treats!